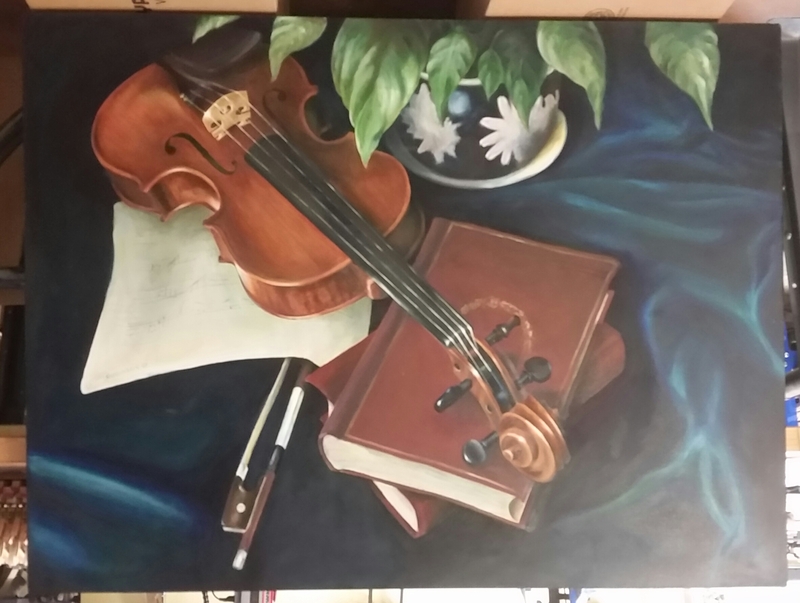 Friends of mine in Portland own my second-ever oil painting, a still life I started as a university and revisited and finished a few years later because they wanted it and I was mortified to think of displaying it as-is (or as-was, I suppose). When I finished the painting, I painted the edges of the canvas black… except for the bottom, where it rested on the easel. The painting hangs in their living room. I’ve been staring at that messy white edge every time I visit for years. This Thanksgiving, I finally remembered the black oil paint and a brush (it helps that my oil paints are no longer in storage — hooray for the new studio! ), and I painted that darned bottom edge. The painting is three feet by four feet, on canvas. I use hardboard panels instead of canvas now, and I haven’t done anything that BIG since that first university class, where it was a requirement. For the most part I think it’s held up pretty well, though I think the light blurs to the right of the book and scroll are the ghosts of past perspective mistakes coming forward to haunt me. It’s been years since I painted with oils, because I just didn’t have the space. You really need decent ventilation, but even more so, you need a space you can get messy. Oil paint takes just short of forever to dry (a scientific and totally non-exaggerated fact) which leaves a significant fraction of forever for you to accidentally transfer paint from the art to your hands to your clothes to the furniture to the pets. I did my little bit of painting in my friend’s garage, to minimize the mess. 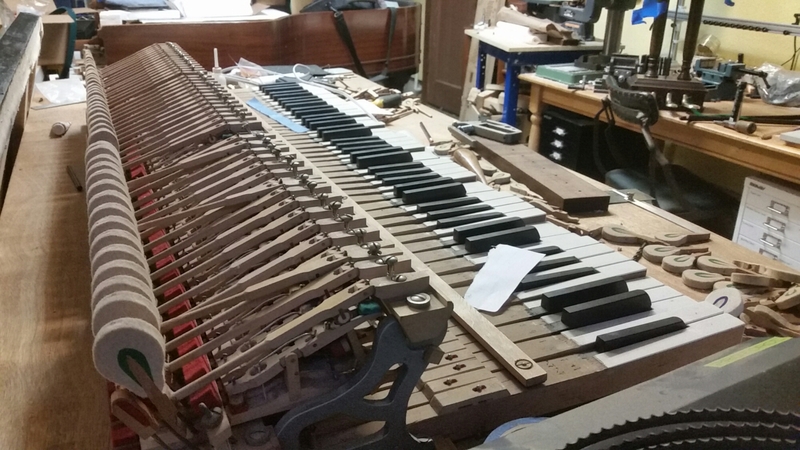 I still had to be careful, because my friend is a piano tuner, and her garage is her repair and rebuilding shop. That also makes it a MUCH more interesting place to hang out than the average garage. 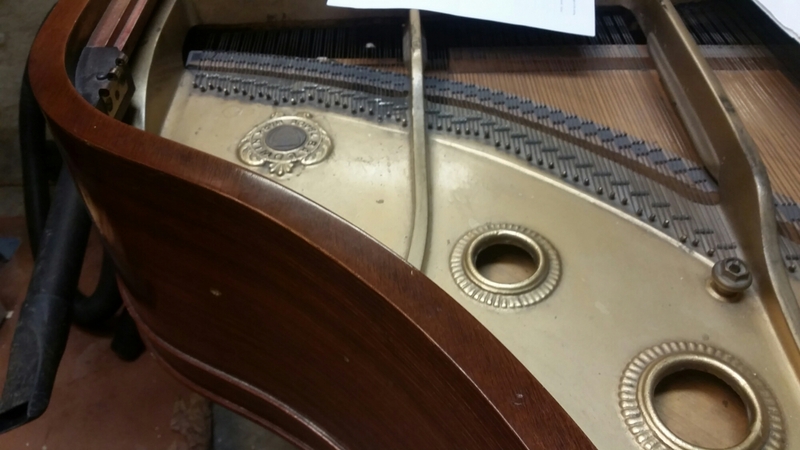 I leaned the painting (upside-down) against a workbench with an upright piano action on it. I was very careful with my little tube of black oil paint.